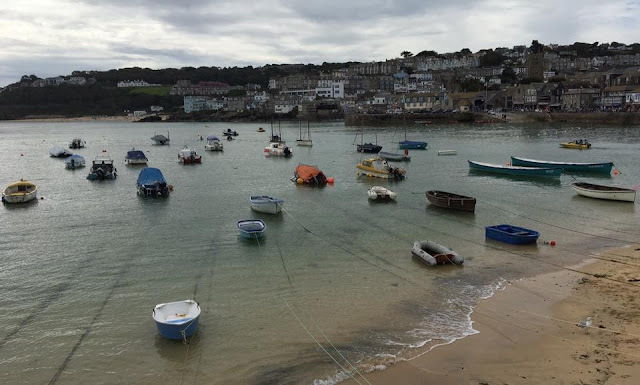 If you follow me on Twitter (@simplyjadeyx - cheeky self promo), you probably know that I spent a couple of days in St Ives, West Cornwall recently. I actually only got back on Friday! 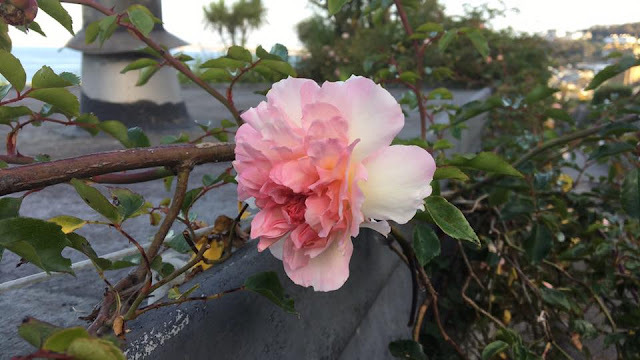 I went with my Aunt & Uncle from Monday afternoon-Friday morning, and we really only went just to explore, enjoy a short break away, and get away from the mania of everyday life. I had a little list of the things I wanted to see too, so we partly went by that. Although I took quite a lot of pictures, these are just a few of my favourites. I took all of them on my iPhone camera, but I thought they were pretty good quality considering! Whenever I go away, I like to take the opportunity to document as much of it as I can, because I really do enjoy photography (it's a hobby of mine) and I can then share my travels and experiences with all of you as well! On the first day, we went to the beach, which was actually opposite the little B&B/guest house that we were staying in. I'm going to do a blog post on it shortly actually! 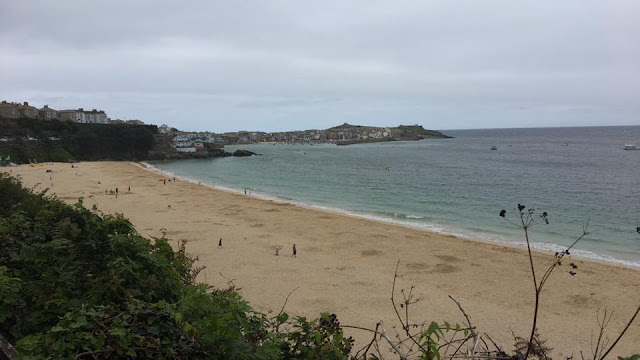 The beach was called Porthminster, and my Aunt and I just wanted to have a paddle, as we had just arrived a little while before, and that was the day which was supposed to have the best weather overall. We just dipped our toes along the sand to have a paddle, and then that night, we went for burgers at a place called Blas Burgerworks. My main, and my dessert were both absolutely delicious and I'd thoroughly recommend the place if you're ever in the area. It's right near the harbour too, so it's the perfect setting really. 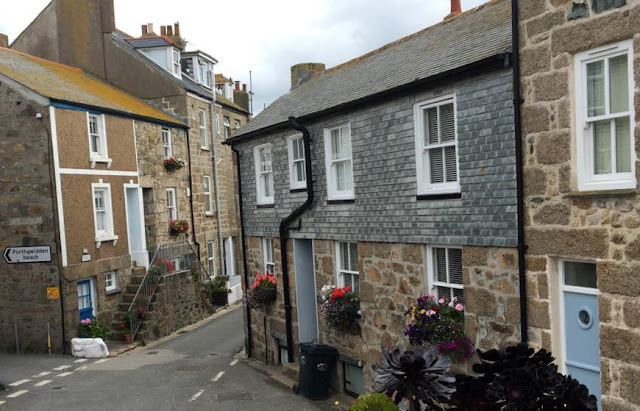 All of the little houses and cottages within St Ives are incredibly cute, and I'd honestly love to live in one of them someday in the future! Even though they're right by the seafront and near to the harbour, it's so peaceful and dreamy walking along the cobbled streets. One of my other favourite places to eat, but one which was along the seafront was Caffe Pasta. As the name would suggest, they do a variety of pasta dishes, but they also do pizzas and other things too. We had such a lovely lunch there, and the staff were friendly, and welcoming, The views were also fab! 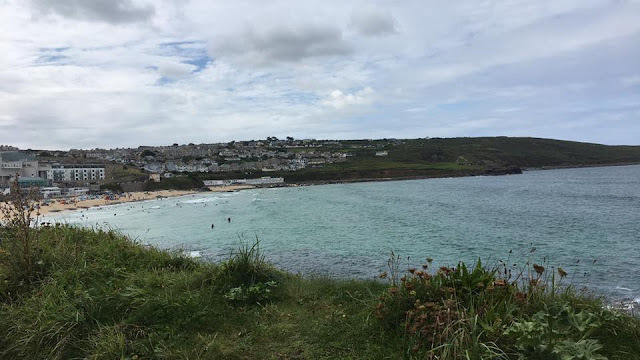 Another place we visited was Carbis Bay. 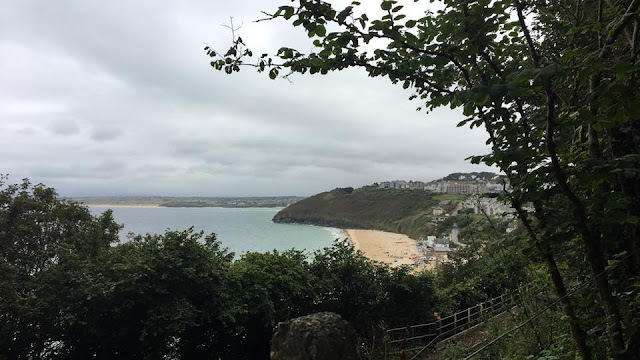 You can go on about a 20-25 minute coastal walk from St Ives itself, and then you'll see the view that's shown in the 4th picture! The beach there is slightly more secluded than the ones in St Ives, and there is also a hotel just opposite. We ate lunch at a little bar & restaurant, and I had a garlic pizza, and chunky chips with garlic butter, which was insanely delicious! It was by far one of the best meals I've ever had. We also visited most of the little galleries, and tourist attractions. 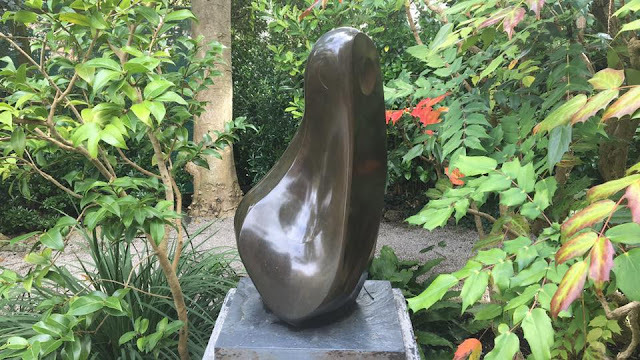 Some of my favourites were the Blue Bramble Gallery, Harbour Galleries, Barbara Hepworth Sculpture Gardens, Art Space Gallery, and Porthminster Gallery. If you ever get the chance, you should definitely visit at least one of them! 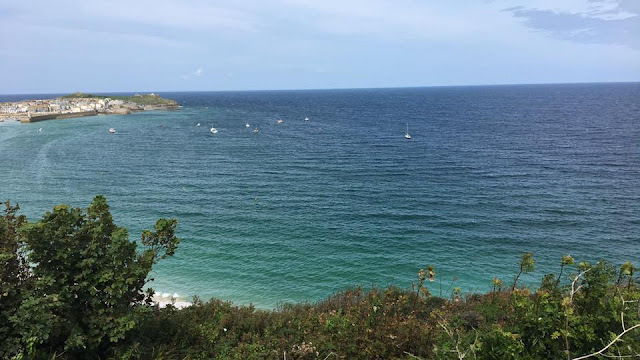 Porthminster, Porthgwidden, Porthmeor and the Harbour beaches are all so pretty, but some are used more for surfing, and water sports, whereas others are more secluded and used for relaxation purposes. The last 2 photos are probably actually the ones I'm most proud of. 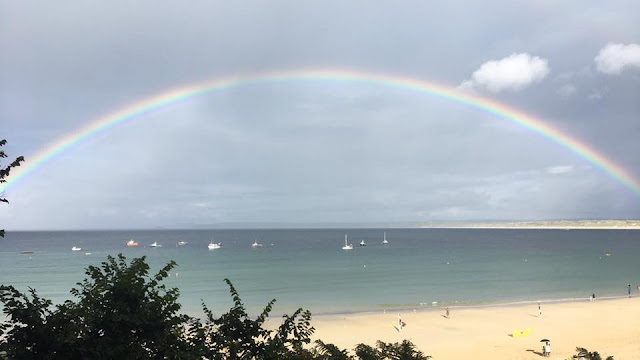 When walking back on the second to last day, we saw the most mesmerising rainbow, which stretched right across the sea! The colours aren't as vibrant on camera, but it really was quite an extraordinary sight, I must say. 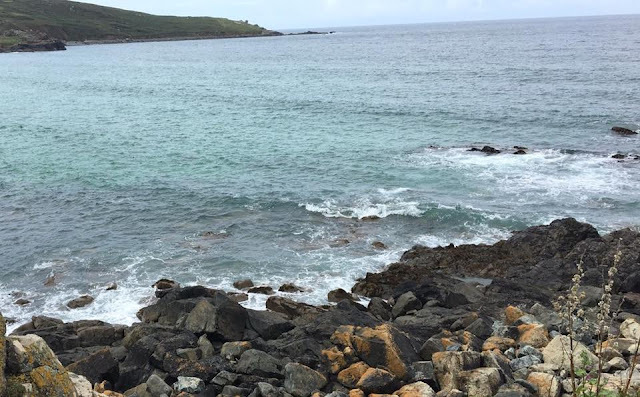 The last photo was of my sea-view from the room that I was staying in. 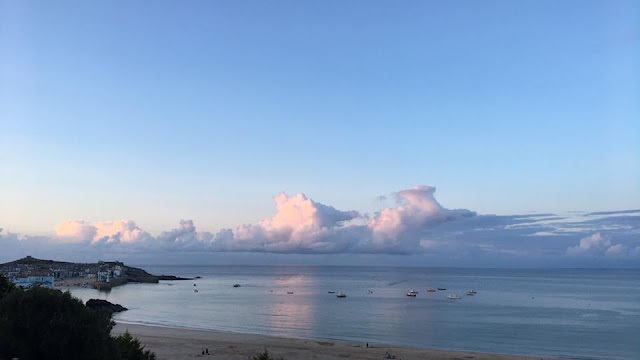 It was on the last night, and I was in awe with the way that you could see the sea itself, the clouds, and even the harbour. Capturing the way the light reflected onto the water was just amazing. 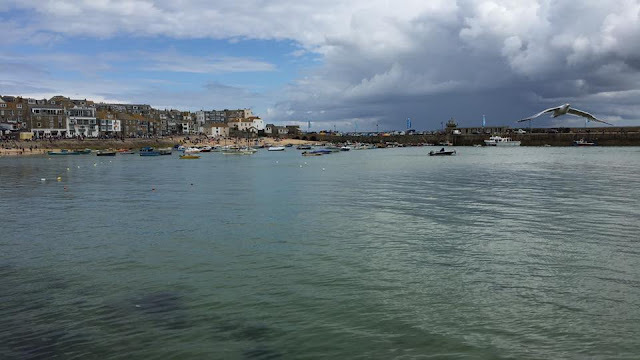 Overall, I had such a lovely time in St Ives, and I definitely feel as though I saw everything that I had hoped to, and more. It had exceeded my expectations, that's for sure! 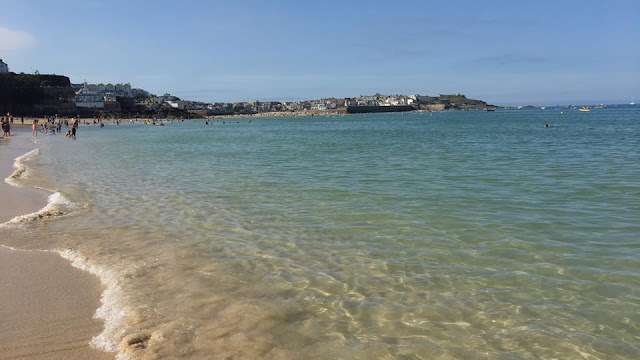 Have you ever been to St Ives, or anywhere in Cornwall? What do you think of these scenic shots that I took?